Dogs are considered a best friend of human beings. Many people prefer them over another species when it comes to keeping a pet. However, one must take care of their health and hygiene as a child. It’s not an easy task, and if this is your first dog, you may not even be aware of their problems and discomforts. 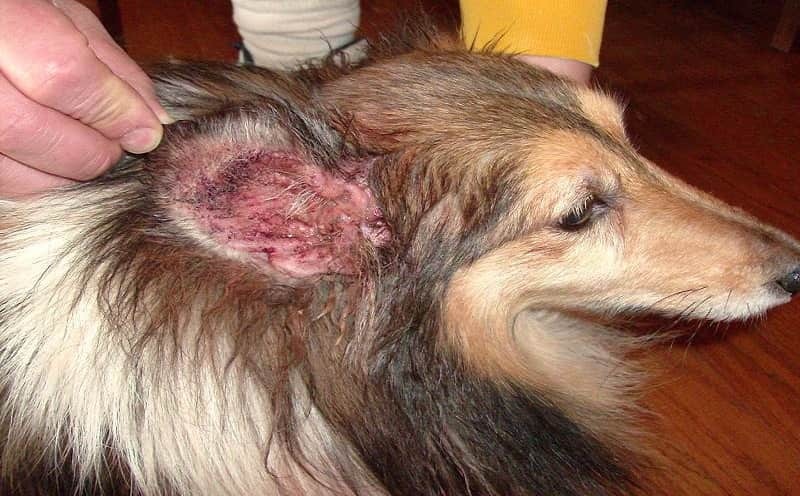 Dog ear infection is one of the most common diseases which impacts this spicy. If you know the symptoms, you can very easily detect whether your dog is suffering from it. They usually keep scratching the back of their ears or would keep their head tilted sideways, or you could observe one of their ears is slightly bent at an angle. If you see any of the above symptoms, you should detect for the ear infection and should be given immediate attention as otherwise, this could impact their hearing ability. There are various home based remedies available to cure the external ear infections in dogs. If the infection is deep inside the ear, taking professional advice is recommended. Some of the basic home remedies are as follows. Apple Cider Vinegar, due to its antifungal and antibacterial properties is appropriate to treat not only humans but cats and dogs as well. Although it is quite acidic in nature, It is safe on skin. When you see, the fungal infection is growing on your dog’s ear you can use diluted apple cider vinegar to clean it. Never use concentrated apple cider vinegar in your dog’s ear since every dog is different and may not be prone to take the acidic nature of apple cider vinegar. To dilute it mix a part of apple cider vinegar to an equal part of water and use it in your dog’s ear. First take the solution in a cotton swab to clean the glint in your dog’s ear, then put eight to ten drops in his ear and slightly massage the ear in a circular motion. In case your dog is getting irritated due to the agitation of acidic apple cider vinegar you can soothe it with few drops of coconut oil. Repeat this two to three time a day until cured completely. It is recommended that you use this remedy two to three days extra after it is cured to ensure there is no re-growth of the fungus in the ear. Witch Hazel is widely found in American continent is known for its medicinal value, especially to clean and cure yeast and infections. It is also called nature’s Neosporin and helps to heal the small cuts and bruises. It is very effective in controlling bleeding from small cuts and relieving itching and redness or inflammation. It also lessens any swelling. All the above properties make it ideal remedy to cure the ear infections in dogs which are an overgrown yeast. First, remove all additional growth of hairs from your dog’s ear to avoid yeast development beneath that. Now with a cleanser or witch hazel liquid cleans the ear and nearby area. Now put some white hazel inside your dog’s ear and leave your dog to shake his head a bit. This movement will help the cure to reach deep inside the ear to cure the yeast completely. Repeat it at least three to four times in a day until it is cured completely. Neem Oil is naturally antiseptic, antibacterial and antifungal remedy and can be used to treat not only humans but dogs as well. It can be used in several ways to ensure the well-being of your dogs. Mix few drops of neem oil in your dog’s shampoo before giving him a bath to ensure his total well-being. This kind of hygiene ensures a check on yeast development on your dog’s body. Next, you can sprinkle a neem oil capsule in his food to keep his gastrointestinal health. Neem Oil helps keep a check on fungal infections in their stomach and intestines. In case your dog is prone to get yeast infections very quickly then you can convert it into a spray by mixing one part of the oil and one part of water and spray if on your dog’s body three to four times in a day. To treat an ear infection, use diluted neem oil and pour it into your dog’s ear. Remember always to use a diluted form of neem oil as neem oil is very strong and can cause irritation to your dog which may make him figid and uncomfortable for long durations. You can repeat it three to four times in a day until your dog is treated thoroughly. Garlic is a popular vegetable known for its medicinal and culinary uses. Its properties like antibacterial, antifungal and antimicrobial make it apt for treating any kinds of skin infections. Its high Sulphur content is one of the secret ingredients that makes it apt as a medicinal product and is also responsible for its strong pungent aroma. Garlic has an ingredient called allicin which helps in relieving the irritation and itchy skin. One can treat ear infections very quickly with homemade warm garlic oil. It works not only on humans but also on pets like cat and dogs. To make garlic oil slice few cloves of garlic and pour it into some oil. Place it in a glass jar and cover the mouth of the jar with some muslin cloth. Now leave this mixture in the sun for ten to fifteen days. Bring back the oil mixture to your kitchen and strain the oil to remove the garlic pieces from it. Your garlic oil is ready for all your medicinal purposes. To treat the ear infection in dogs, add few drops of garlic oil into his ear and massage his ear in a circular motion. The oil should be cleaned within forty-eight hours to avoid it to cause another infection. Due to sticky nature of oil, it may welcome dirt and mites to settle and give a perfect atmosphere for it to grow. Repeat this at least 2-3 times in a day until it is cured completely.